In the future, the ostensible purpose of this blog (the intersection of board games and computer games) will be a moot point. All board games will have some kind of computer component, and those that don’t will not have one as an aesthetic choice, rather than because it’s prohibitively expensive, or because the interface doesn’t exist, or for the myriad of other reasons today’s board games do not have a computer component. In the mean time, there will be more and more devices that bridge the gap, becoming essentially computers on which you can play board games (the iPad, for example), or board games on which you play video games. I would argue that Sifteo is the first in the latter category of devices. I should say up front that Sifteo cubes haven’t even been released to the general public yet. Those of us who have them are essentially part of Sifteo’s beta program. They’re calling it “Early Access”. Essentially, they sold some cubes (probably 1,000 sets of 3) to folks during CES, which was a sort of preview launch. They sold them online, which is how I got a set, even though I didn’t go to CES this year. Overall, my impression that there is A LOT of potential in these little cubes. Sifteo has a great product on their hands, but unfortunately, I don’t think it’s going to be a hit product without some notable modifications. I hope (and it seems probable) that Sifteo will have the chance (and wherewithal) to fix some of these issues in subsequent versions of their product. If they do, this could easily be very big, and Sifteo has the potential to compete with other hand-held gaming systems like the DS or PSP. The cubes themselves are pretty great, but have some notable limitations (see my detailed beefs below). The overall product, unfortunately, requires a computer to be running custom software (called Siftrunner) while you play, and a wifi dongle to communicate with the cubes. The software then pushes out whatever game you’ve chosen to play to the cubes. The game choices are pretty limited right now, and unfortunately, mostly fairly mediocre. I’ll go into more of the software in detail below, but the one game they chose to include in your purchase price is called Chroma Shuffle, and is actually really great. It manages to show off many of the device capabilities really well, and had me sucked-in for hours the night I finally got my cubes up and running. Summary of my summary: not great, but enormous potential. This is a new technology, so I tend to naturally get more excited about it as a result. That having been said, I found a lot to complain about with these cubes. Viewing angle. First thing first, the viewing angle on the cube screens is not great. In fact, by not great, I mean downright bad. As with cheap cell phones and other screens of this low resolution, when the angle is off, the colors are off, and in a game like Chroma Shuffle, where you are matching colors, it can get really frustrating. This is “enhanced” by the fact that you’re constantly moving the cubes around, and while you move them around, you might end up moving one farther away than the others (thus changing your viewing angle). Color consistency. Very closely related to my previous complaint, the color on all my cubes even under the best viewing circumstances is actually not exactly the same. One cube is slightly “dimmer” than the others, and while it wouldn’t normally matter all that much, this type of quality difference is frustrating while playing a game where you’re intensely matching colors. Graphics are old school… really old school. The graphics for all the games I’ve played so far consist of VERY simple animations. I don’t know what we’re going to see in the future, but for now at least, I have to assume that the hardware is simply not capable of very much in the way of animation. It would have been really nice to see some 3D graphics (maybe a bouncing a 3d-looking ball around the cubes or something), just to prove that it can be done. Without a tech demo of that kind, I sort of have to assume we’re limited to simple 2D animations, and that really just seems like a missed opportunity. Mount Brainiac is a suite of games that will help children practice their spelling and math skills. With six different exercises for kids aged 5-8, Mount Brainiac gets more challenging as children get older. Exercise your mental muscles and climb the mountain! I have already spoken briefly a bit about Chroma Shuffle, but I’ll go into a bit more detail now. Essentially, it’s a matching tile puzzle game similar to a match-3, but more in the vein of the Collapse! series of games. Each tile holds a 4×4 grid of circles. There might be several different colors of circle on each tile. You then have to match tile edges together in order to match colors along the edge of the tiles. When two colors match, those circles are removed, and then subsequently any additional circles matching that color adjacent to the original matching circles. The more circles in the group that is matched, the more points you get for removing them. You can match circles on more than two tiles at once by pushing them together at the same time. It seems like there is some “slop” in this matching, so it’s fairly easy to match a group on all three tiles. The core game mechanic of looking for matching edges of the tiles is pretty fun, and the logical/thinking aspect of the game is enhanced by allowing you to tilt the tiles and shift all the circles toward the downward facing edge. When you get to the higher levels, there are circles outlined in a square that cannot be shifted in this way, and that’s when things really get interesting. 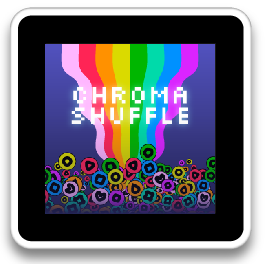 Chroma Shuffle has two basic game modes, Puzzle and Arcade. You start off only playing puzzle, and it introduces you to the game concepts by spoon feeding you them in a few tutorial puzzles. You never really feel spoon fed, however, and the game’s pace increases until the puzzles do actually get pretty decently difficult. Unfortunately, that’s probably not until around puzzle number 20, and there are only 26 puzzles in total. There is also a random puzzle mode, and that actually generates random puzzles. Arcade mode consists of either Timer or Flips mode. In Arcade, you essentially match all the circles in a tile, and then flip it over to refill it with more colors. The longer you play, the more colors appear and the harder it is to not get “stuck” with a square piece in the middle of the tile (away from the edges where you could match it easily). Timed ends when you haven’t made a match after a certain length of time, and Flips ends when you’ve flipped each of the tiles three times (without clearing them first). I’ve only played Flips once, and my game took probably an hour to finish. I didn’t want to stop playing because I didn’t know if my game would be saved when I did. I should experiment with that to find out what happens when you “stop” Siftrunner when you have a game in progress. The third game at the $8 price range is called Booker the Penguin. This is a very simple action game where you’re in control of a penguin character that is essentially running through a 2D maze made of roads. Each of the tiles that doesn’t have the penguin on it shows the shape of a road. When one of those tiles is placed next to the tile with Booker on it, Booker will run toward that tile, and it becomes the new tile to put your other tiles up against. There is an Adventure mode here that gets progressively harder, where in the first few levels you are just running around collecting eggs, and then eventually they introduce an owlbear that is trying to eat you. The hardest part about the owlbear is not so much that you have a shorter time in which to make decisions about which tile to play, but actually that you are limited in the direction in which you can move. If you accidentally go back, the owlbear is there waiting to eat you. It really limits your options, which is good, because the game definitely feels “too easy” in the beginning. I probably haven’t played it enough yet, because I haven’t played through the purported 11 levels of Adventure Mode. There is also an Endless mode, which I have yet to try, and a mode where you play as the owlbear, trying to eat all the little penguins. As I said, I still need to give a bit more time to Booker before I make a final judgement, but my initial impressions were just that it was too simple to be that much fun. Later levels add some complexity, but I’m not feeling it yet. Oogor’s Day is a storytelling game that lets you do more than just choose the course of the adventure – it lets you control it directly. Use your Sifteo cubes to bring characters to life and have them interact with each other. Your actions will influence the flow of the story. How will Oogor’s day go? It’s all up to you. After Oogor’s day, there are a few games/apps for a dollar. A tile shuffling game called No Evil Monkeys, (think of the picture puzzles where you have to re-arrange a puzzle by sliding tiles into the empty spot on the board), a simon-says style speed/reaction game called Do the Sift, and a word game called Word Play. No Evil Monkeys is made more difficult because you can easily get frustratingly lost with all three tiles involved. Orientation is also a factor, and some of the quadrants of the images are actually ambiguous as to which orientation is the right one. Do the Sift runs you through ten repetitions/turns where it tells you what you need to do to advance to the next turn. It might be flipping the tile over, or just tilting it a bit, shaking it, making sure all the tiles are touching, or any number of other things. I think this is another fun game that shows off the device capabilities pretty well. I’m fairly certain it was designed to do just that. My main complaint is that it (again) doesn’t really get difficult fast enough. The first 10 levels are fairly slow, and each subsequent 10 levels speeds the game up slightly, although it doesn’t appear to get more difficult in terms of what actions you’re asked to perform or anything like that. Word Play is the definitive word game for Sifteo cubes. Arrange your cubes to spell as many words as possible in the time given. Play Explore mode to practice, or Score mode to go after the high score. Challenge your friends and expand your vocabulary! I play a lot of word games, and yet another one where you’re just seeing what words you can make with a combination of letters doesn’t seem all that innovative or appealing. Just because it’s a new platform doesn’t mean you should re-write a game that’s been done to death already. The jury is still out! I absolutely love the concept, and really want Sifteo cubes to be successful, but as you have just read, I think the current implementation has a lot of problems. None of these are overwhelming problems, but when summed together, the product doesn’t feel ready yet. A few more games of Chroma Shuffle’s caliber, and it might feel “good enough” to launch, but I’m glad this is an “Early Access”, and not the final product. When I first heard about Sifteo, just before the CES pre-order, I read on some forum somewhere about another company with a very similar product in Europe. After trying various google searches for the last hour, I haven’t been able to find reference to that other company in the avalanche of Sifteo press. This is both a good thing (yay Sifteo!) but also a bad thing, because I’d like to see some competition in this space to liven things up. I do believe this is one of those “this is the future” moments. If Sifteo plays their cards right, they could be the next big tabletop gaming phenomena.